Home > Battery Storage > Beware of Blended Payback: Solar Pays For Itself But Batteries Don’t Yet. Wait a minute! Calm down! You say you don’t want me to burn half the money your investment makes? I don’t understand why you are complaining. You will still come out ahead! If someone seriously tried to make you the above deal, you’d have no trouble at all telling them to go and make love to a cactus. But unfortunately for Australian households, including many who may not have much money to spare, there are unscrupulous salespeople more cunning and more convincing than Ronald Trump, who are ripping people off in a similar way by blending the high return from rooftop solar with the zero to negative return from batteries to make it look as though batteries can now pay for themselves. And it’s resulting in a good portion of people’s money going up in smoke. I have no problem with people buying batteries that won’t save them money if that is what they want to do, but I am totally against deceiving people into blowing money by buying batteries they would never have bought if they knew they would be losing money on them. At the moment no battery pays for itself, not for normal on-grid households, so if you see payback claims advertised for solar and batteries, make sure they also disclose what return you can expect from each independently. If the company can’t or won’t tell you, then you’ll know you are dealing with someone dodgy. Every time I write about batteries I am unfortunately forced to remind people they don’t pay for themselves yet. Not for anyone whose electricity consumption is remotely normal, even in the most favorable locations in Australia. I should explain what I mean when I say they don’t pay for themselves. It’s not enough for a $10,000 battery system to save $10,001 on electricity bills in today’s money by the end of its life to be worthwile. It will also have to save at least as much value as the next best use of that $10,000 would have provided. For some people, the next best use may be a term deposit. For others it could be paying off the house, investing in shares, or paying off credit cards. 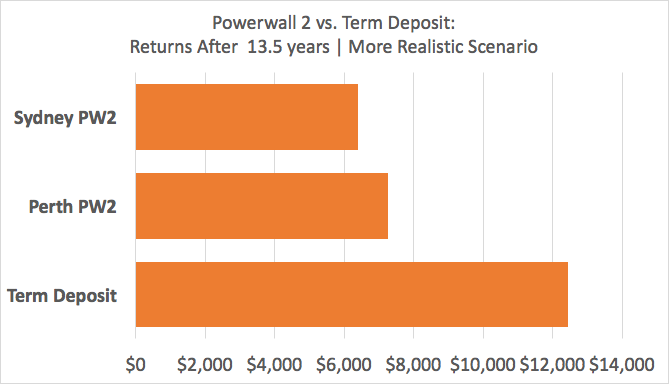 In an earlier article I examined if a Powerwall 2 could clear the lowest hurdle of performing better than putting the money into a term deposit and it could not. This was the case even though I used the $10,150 figure for full installation provided by Tesla and not the $11,000 to $13,000 it is likely to cost in the real world. The Tesla Powerwall 2 is very likely to be the cheapest battery system available per installed kilowatt-hour2 over the short term at least. This means any salesperson who tells you buying batteries now will save you money is almost certainly wrong3. Grid electricity prices are, once again, rising. While this will only improve the payback time of rooftop solar it is unlikely to improve the payback time of batteries because solar feed-in tariffs are expected to rise by around the same amount. It is possible the combined price hikes and feed-in tariff increases will make the economics of batteries worse, as I explained here. While home batteries don’t pay for themselves yet, rooftop solar sure as hell does. It is the best investment most home owners can make. Not only does it save money, it also saves the planet! Alternatively, for those whose hearts aren’t filled to the brim with unbridled capitalism — Not only does it save the planet, it also saves money! Here in Adelaide, a household that consumes half the electricity produced by a 5 kilowatt system that costs $7,000 can have a payback time of under 5 years. In other words, it can take less than 5 years for the savings on electricity bills to total $7,000. 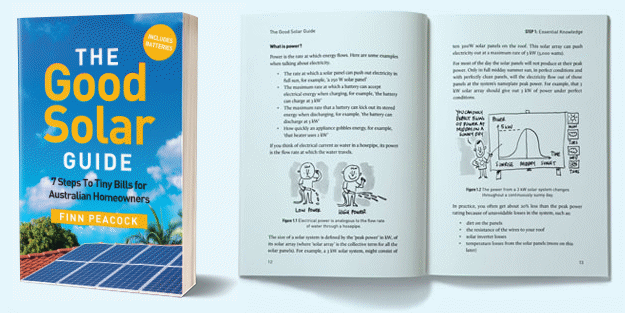 If the household instead only consumed 30% of the solar electricity generated, then with a 10 cent feed-in tariff, which is easily available, it can have a payback time of 6 years. 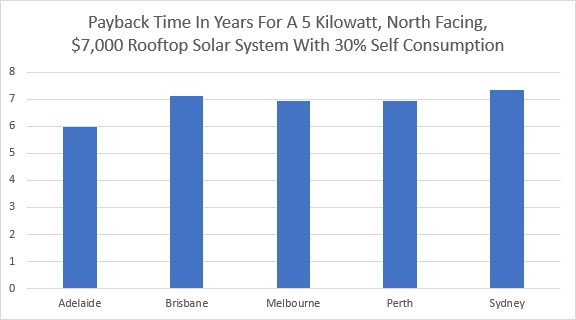 Since electricity prices are about to go up in July in every state except Victoria, which had an increase at the start of the year, payback times will only improve and rooftop solar will become an even better investment. Because batteries don’t yet pay for themselves and currently don’t provide an environmental benefit4, no one who is interested in saving money is going to buy them unless they are deceived. Good salespeople, as in ethically good and not just good at shifting product, understand this and focus on selling batteries to early adopters who are interested in the technology and don’t mind if it doesn’t save them money. Bad salespeople, as in ethically bad puppy kickers, use blended payback to lie to people and imply batteries will save money. They know batteries won’t pay for themselves, but intentionally hide this fact by blending the payback time of rooftop solar and batteries together to make a sale. And this just isn’t good enough. Sure, provided they are careful with what they say they may not technically be doing anything illegal, but you don’t have to be a criminal to be an arse. There are people in Australia who are struggling to get by — people raising kids, pensioners on fixed incomes, those who are trying to pay off their homes — who are looking to save money on their electricity bills and hopefully do the right thing by the environment. They don’t deserve to be ripped off by unscrupulous salespeople. Even the people who have plenty of money don’t deserve to be ripped off. As costs fall, home battery storage is likely to become a huge business in Australia. When people can save money by installing batteries the market will boom. But the battery industry is only going to be make things hard for themselves if they allow people to become convinced the industry is full of crooks. One ripped off customer now will cost who-knows-how-many sales in the future. Rather than building up a good reputation that will pay off later when the battery boom begins, current players may be handing the market on a platter to late entrants who haven’t burdened themselves with a bad reputation. These days the internet makes it much harder to sweep a bad rep under the rug and sell to new rubes. This makes it even more important to build a good reputation from day one. Products must be fit for the purpose the business told you it would be fit for and for any purpose that you made known to the business before purchasing. This means a product must do what the seller said it would. If you were told a battery system will save you money and it does not then you are protected by your consumer guarantees and entitled to a remedy, which in this case would be a refund, as a repair or replacement will not solve the problem. It also means if you tell them you want to buy a battery system to save money, then they can only sell you a battery system that will save you money. I’m no lawyer, but I do think companies that hide the fact batteries don’t save money by blending their payback with that of rooftop solar are on thin ice. 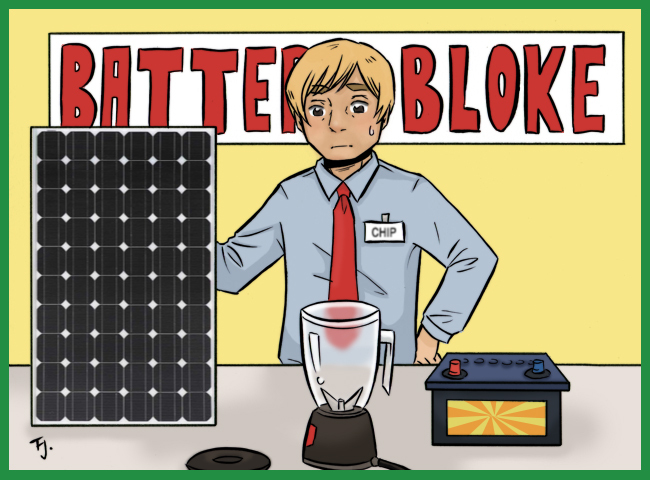 Australian consumer law is based on what a reasonable person would conclude and I don’t think any reasonable person looking to save money would buy a bundled solar and battery system, if they knew the battery part was only likely to lose them money. So my final word is, never buy bundled solar and batteries from someone who won’t give you an honest independent breakdown of their payback separate from each other. It’s not ethical for salespeople to give pensioners, like my grandmother, who are looking to save a bit of money and leave a better world to their grand kids, blended paybacks for solar and batteries that imply batteries will save them money when they will do no such thing. It’s no more ethical than a surgeon who performs a life saving operation, takes out a kidney while he’s at it, sells it on the black market, and justifies it by saying the patient has come out ahead overall. Thanks for sorting out the facts from the sales talk. I thought batteries might be of value but then when i read your info i realise that would only be during a prolonged electricity outage. Then i read that a generator which i have, would be cheaper!!! Don’t have to be an Einstein to work out the truth about batteries!!! PS Would getting a switch in my meter box to plug in a generator be a good idea?? Around $3-400 cost approx. Because a sparky will often have to change loads around so that only essential loads are powered by the generator to ensure it doesn’t get overloaded, if you can get a switch that will cut your house off from the grid and let you run it off your generator for three to four hundred dollars, that would be a good deal in my opinion. Whether or not it is worth it depends on how often you have blackouts. Some people are happy enough to just have their generator outside and use an extension cord to power appliances. What is your opinion on thee use of nickel-iron bateries for solar storage? In my opinion, properly designed nickel-iron batteries are the most reliable form of battery storage available – for people who don’t have a problem completely replacing the electrolyte when required, after hopefully many years of use. Most people consider the economics of lead-acid to be better for off-grid use. On-grid I’m afraid no battery chemistry can pay for itself at the moment. Personally I think lithium or potentially other chemistries will be a lot cheaper in 5 years, so I’m not sure if it makes sense to buy batteries now that can potentially last for 50+ years, but nickel-iron certainly has its fans. The claims made about Nickel iron batteries are almost as outrageous as the claims made about batteries saving money. I urge you not to believe the sales talk put out by the 2 main dodgy US vendors and instead read the actual specs published by the Chinese company that manufactured them. BTW different John to the other one in this thread! There’s a lot of nickel-iron batteries still in use in the States. The original battery was developed by Thomas Edison more than 100 years ago and started selling in 1901. Thomas Edison’s Orange, New Jersey, battery factory was sold to Exide in 1972, then the dirty corrupt suits at the top ran the company into bankruptcy. The Chinese acquired the technology at a fire sale, and their battery product is now called the Edison. Just another example of American corruption at its finest while our wonderful bloated government shills look the other way. I’m still a bit confused here. I’m trying to work out if batteries are feasible in my situation. I use an electric car and charge for 5 hours every night @ 2350 watts = 10 kWh/day (with some variations up & down). As is usual with electric cars I (mostly) drive during daylight & charge at night. I am not especially clued up on solar or batteries, but I would have thought it would make sense to install a battery in this situation. I’m afraid storing surplus solar electricity in a battery and then using it late at night instead of off-peak power won’t pay for itself. Currently batteries can’t pay for themselves when used to provide peak power for normal households. Currently, if you are not home during the day, you are far better off getting a 10 cent feed-in tariff for sending solar electricity into the grid during the day and paying for off-peak electricity to charge your car at night. Ten cent or higher feed-in tariffs are now available in Queensland, NSW, Victoria, and SA. Ronald is right – the problem with stuffing 10kWh offpeak into your car batt is that only equates to about a $1 in savings per night. But if you’d sold that same energy back to the grid you’d have made about $0.60 so the net gainis only 40c per night. If the batteries were 100% efficient which they aren’t – you’ll lose at least 10% in conversion and storage whick means you only save 34c per day. Plus if you want to use some of that energy for peak consumption you probably need a minimum size battery of 20kWh – you won’t even save the additional capital cost of installing a larger battery. Or even the interest you could earn on that additional capital. I have to disagree with you Ronald on all accounts. You will save more and do better by the environment by installing more solar panels or buying someone else solar panels. Firstly, certain batteries will pay for themselves. Put simply, the battery is more economic because it allows you to save money everyday, which a generator doesn’t (not even accounting for fuel costs) AND it allows your system to function normally even when the grid is down. In my opinion, that in itself is priceless. Furthermore, batteries are good for the environment and installing more solar is better. Battery production is large-scale and resource intensive – I agree with you there, however per kWh of storage or per $ of the batteries cost, it is negligible compared to most other items you can buy or the dirty power plants. If that argument fails to satisfy, then think about this: If instead of buying batteries we put on more solar, the need for fossil fuel generation is going to dip below the baseload pretty fast. However baseload cannot be turned off because it is needed at 4pm when the sun starts to go down. So instead of storing our solar, it would be feeding into the grid and not reducing emissions at all because the baseload coal is still producing. Batteries are good for the environment because they prevent this. Actually fossil fuel power stations *can* vary their output. AEMO schedules their output on a 5-minute basis. And electricity is shared around the eastern states too. So electricity you feed into the grid *does* directly reduce the amount of power from centralised power stations. Even if they do, running them at lower-than-rated outputs would reduce their efficiency. Also I didn’t say solar generation doesn’t reduce demand from fossil generation, I said it doesn’t reduce emissions. on a battery exceeds the warranty of the battery. If the salesman is honest he will point out the benefits of running a battery (environment, emergency power) but they should also point out that they don’t save you money. If the salesman is honest, he’ll point out that the battery doesn’t directly benefit the environment (in most situations anyway). Their benefits are more long-term, by supporting the battery industry that’ll be important later, when renewables are a higher percentage of generation. Solar generation *does* reduce emissions. Hey Ronald, love your columns. You blokes down in the Land Down Under can bash Donald Trump, but he won by a landslide even with the corrupt HRC Bilderberg elitists still trying to stuff the ballot boxes. American cities have been destroyed so that a Chinese middle class could be built. Almost all of our manufacturing is gone. Trump wants a level playing field, and that means the ChiComs which the elitists put in power in 1949 with Mao Sedong are going to have to play fair, or there will be war. I’ve seen Americans say that they fear Huawei and Chinese companies, but that is only because the Chinese tax rates and subsidization is much different than here in America, and that is due to the stinking leftists. I hope Donald can deliver, for there are many, many government shills for the globalists like Ryan, McConnell, Pelosi, Brown, Deblasio, Reid, Romney, Shumer and many others. Maybe its 1930’s repeat all over again, who knows. The leftists over here have destroyed the public school systems and polluted the p.c. landscape with gender and bathroom issues, while the young boys barely know how to do anything — basic math, mechanics, etc. No, no, no, Trump is liked by the common blokes over here Ronald, and his latest salvo in getting out of the Paris agreement is a welcome move. Sorry, but American taxpayers are not bearing the burden. How about Australia pay $3B a year to Israel or to the U.N. to start things out??? Yeah, how about it. Sorry that the Rothchilds, Soros, HRC, Obama and the rest of the leftists scum don’t agree, but we’re sick of it over here. You see Ronald, with another leftist win, my country would have been history. Trump is for MAGA and putting Americans first — not Chinese, not Indians, not Mexicans, not Australians. My country’s cities like Detroit, Hartford, Jacksonville, Chicago, Cinncinatti, and many, many others have suffered under the dirty elitists globalism promise for 50 years. You bash Trump, but the mess the leftists left behind is “yuge” as you say. Leftists destroy the economy and spend all the people’s money until there is nothing left but huge masses of people on welfare and foodstamp rolls like we have now in my country (look at Cuba, Venezuelas, East Germany, North Korea — it doesn’t work). You want to play the con story, then start with a Weatherman traitor in the Whitehouse like Obama being stuffed by Ayers, then the corrupt dirty Clintons, Bushes and the rest of the Bilderberg scum. Trump is an American, and I don’t like Trump bashing without putting some history behind it first. Stop drinking the Kool-aid and understand what the globalists are truly doing under the Kissinger, Brezinski, Soros agenda. They don’t care about global warming — it’s all about scarcity and taking away freedom and controlling power and taking it away from the commoners until they’re living in the dark. Trump is a hero here, and the elitists don’t like it. I just hope he isn’t another JFK, because then militias in my country will rise up. It’s best you hear this from an American who voted for Donald, Ronald, and I’ll understand if you don’t print this political hot air, BUT you started it. Popular vote? Please!!! Whose popular vote are you looking at? Carlos Slim NY Times? Bezos Washington Post? Gates MSNBC, Rockefeller globalist ABC, CBS, NBC, CNN (Clinbton News Network)? Sure, Koch Brothers are with the globalists; they tried to kill solar in Florida on Amendment#1 and barely failed. Conspiracy theories….ha,ha,ha, you’ve exposed your education. Where did you get that from? The fake news gave you that term. People always label pundits as kooks to ward the sheeple away from the real issues. Move along, nothing here folks. Look, the enemy of my enemy is my friend, and we both want energy freedom, right? Decentralized power is the way; solar and storage can help us get energy freedom. Cheers. Hey TJ – I’m confused. Nowhere did Ronald mention Donald Trump? He mentioned Ronald Trump a completely unrelated and fictional battery salesman. And what problem do you have with “lefties”? I’m right handed myself but I understand approximately 10% of the population are left handed but you seem to hate all of them. In fact you seem to hate a lot of things. It must be hard going through life so angry. You should come to Australia – we’re a lot more relaxed down here. Unfortunately we do drive on the left hand side of the road, but if you lived here you wouldn’t be angry about that. Does EVERYTHING have to pay for itself? Apparently in the authors eye it does. The choice of a battery bank gives you many other benefits that you cannot put a price on. One of the biggest problems with the capitalist society is that if you do not have a “payback” then somehow it is not worth putting your money into. That is truly a sad state of affairs. People buy many things that have a ZERO payback or simple never will have any type of payback. Paying a utility bill for the rest of your life certainly has no payback does it? You buy nothing and thus own nothing. Choosing a battery bank such as Nickel iron or a lithium battery that has a 10 year warranty and has 10,000 to 11,000 cycles certainly is a good deal in the long run. In 10 years or so a battery pack will look like an appliance and cost will be of little concern. But you know what? Energy independence is priceless for more than one reason. If you’re talking about going off-grid, that’s another issue – this post was specifically about on-grid batteries. That sounds like you. Good on you. There are lots of reasons to buy batteries – as you point out – saving money is just one of them. The problem is when companies try to mislead customers who want to save money by using blended payback. I am someone who has money ready to buy a battery as soon as I can find someone who can give me the specification I need. I am doing this despite the fact that I know (as Ronald points out), this investment will fall well short of the economics that can be justified by future electricity cost savings. But I am doing this with a full understanding of the economics. In my personal “justification”, I am only looking for 1/3rd of the cost to be justified through future electricity price savings, and the other 2/3rds justified through my own personal circumstances (running a IT business from home, where we have a LOT of blackouts and in a lot of cases a generator is not the most practical solution to the problem…eg nowhere I want to place a noisy smell generator and will not cut in fast enough to keep servers up, so need some battery anyway). But if I take a hard nose look at the numbers for “payback” of batteries from electricity savings alone, even though I only need to justify about 1/3 of the cost, and even though I probably am better placed get this payback than a lot of people (ie high electricity usage in peak times when sun is not up, and living in NSW TOU metering), I would struggle to justify it if I needed to pay for more than about 1/3 for all the reasons Ronald outlines. To defense of Ronald, I don’t think he is in any way suggesting you should not buy batteries. But he is trying to educate, and VERY sensibly debunk some of the miss information that is being spread by a lot of vendors, sales people and all too often lapped up by the media. If you want to buy batteries, and have reasons for doing it, go ahead and buy batteries. We do need early adopters to develop and refine the technology, and in time this will drive the price down. And if you have a way of justifying that to yourself, so much the better. But it certainly should not be done on the basis of an economic justification that does not stack up, and this is what Ronald and others are fighting against. As a case in point, my 80 yo father has had multiple proposals from solar battery installers who have told him he will save money, and each time was ready to sign until I did some education with him to point out the rather simile fact Ronald has outlined. I have even spoke to the installers, and they continued to try to convince me that there was a payback!! Usually they will give no numbers to back their wild assumptions, or if they do, the assumptions are totally unrealistic. Interestingly, none of these proponents used “grid down” as justification. I assume this is because 1) for most people this is pretty rare, and not that much of an issue, and 2) a lot of the setups they are selling in this space will not provide power in grid down anyway. I am a big believer and batteries, and think they will play a very important role in the energy mix, and help us solve the problems created in the transition from fossil to renewable power. But I don’t think it helps the cause to claim economic cost justifications, and exaggerated paybacks where it is not realistic. I don’t think Ronald has anything against people who want to buy batteries, or even suggesting that everything has to pay for itself. Just that if someone makes a claim about payback time, those claims should stand up to some form of basic scrutiny. Keep up the good work Ronald and Co.
Now that’s a proper case for a battery. To size it properly you just need to work out how much power the essential equipment needs to run – so your servers, internet connection, fridge, lights and monitors etc. Then work out what the maximum amount of time you could be down for. Then its just math. Say your essentials draw 3kW – thats a lot but servers can be power hungry. Refrigerators don’t run continuously but when the pump switches in thats a very high inductive load so you need a battery and inverter system with plenty of power overhead – say 50% or 4.5kW. So say you want to cover the grid being down for 3 hours then a 10kWh battery should suffice. You’ll also need an automatic switch and a sparky to wire in only the essential circuits to that backup system. Essentially you are building a large UPS. Rather than investing in additional capacity you might consider a genny to keep the battery topped up if the grid goes down for longer at night. The battery will act as a buffer and supply clean power to the system. To calculate your own needs read your meter and then run only those essentials for a couple of hours, read it again and divide by two or invest in kill-o-watt meter and total up the actual usage. There are two ways of accessing the efficacy of batteries. One school of thought is the savings they generate should be expressed as the number of years to pay back the capital. This calculation is commonly referred to as ‘Payback in Years’. The argument that follows is the payback should be less than the period of the warranty aka useful life. The other school of thought is ‘Return of Investment [ROI] where the capital produces a better Tax Free return than if the money was invested in any other risk free investment. Ok the first example for a 1.2 kW Enphase storage battery with an hourly charge and discharge rate is 240 watt-hours or 60 watt-hours per 15 minute timed interval. If the anytime tariff is .27072c kWh and the Feed in .07448 then the kWh value of storage per kWh discharged is 0.19624c. But that is not the end of the calculation because for every kWh stored you loose approximately 15.59% available to discharge. Ok so the numbers in the last twelve months with a 1.2 kW Battery we stored 385.14 kWh <= 1 charge to <= 1 charge. In the same period the battery contributed to consumption 325.08 kWh <= 1 charge to <= 1 charge a loss of 60.6 kWh 15.59%. At a value of 0.19624c kWh the savings on 325.08 kWh was $63.79 in 12 months. And the value of the lost energy at the same value was $4.47. Given the battery cost $2,200 divided by the savings $63.89 then the payback is 34.5 years [rounded]. Now for the second option if you had $2,200 invested in a government guaranteed fixed term deposit [risk free] with a Major Bank the current rate would be around about 2.00% PA or $44.00 less PAYE Tax at 32.5% net gain $29.70 or 1.35% on the sum invested. Ok if you purchased a battery for $2,200 and it reduced your cost by $63.79 PA then the ROI on that investment Tax Free would be 2.85% compared with 1.35% you would be 1.5% better off. If you are a pensioner and the capital is assessed at the deeming rate then that creates yet another method required to calculate the ROI. That is just so wrong. For a start your gov bond is a low interest rate because of security – you could invest in the share market and exceed that value by a lot. And it wouldn’t be any riskier than a battery which is guaranteed to depreciate substantially over its warranted 10 year lifespan. Depreciate in capacity and value. Good luck selling your second hand battery for even 30% of what you bought it for. Meanwhile the pensioner (even allowing for inflation) still has the majority of his gov bond capital intact. To sell to the poorest section of the community on that basis would be unethical. IMO. Should look at this one Ronald – you could save 80%! It is important to consider the effect of batteries on consumption behaviour. I’ve just ordered a powerwall2, and for us, I imagine that a battery would turn our power consumption into a game, and motivate us not to over-consume power in the evenings in an effort not to start drawing from the grid. In addition to paying for 100% green power for environmental reasons, I think that the battery will actually pay itself off. These are not the only issues to consider when it comes to storage 1] You have enough surplus Solar production to charge the batteries during sunlight hours at the regulated charge rate. In our case it is 240 watts-hours. 2] The loss of energy which for us for every 1 kWh stored we get back 850 watt-hours. 3] The consumption rate should preferably be is less than the regulated discharge rate of the battery which in our case is 240 watts-hours. Whilst the battery might have storage available if it cannot deliver then the balance will be imported from the grid. The time interval 3-9pm is a critical issue if you have subscribed to a Seasonal Demand Charge Tariff. And during a period of high demand a Time-varying Feed-in Tariff may need to be ruled in or out when considered as an optimisation option. Details about Time-varying Feed are published elsewhere by SolarQuotes. Charge and dischsrge rates are measured in watts or amps not watt hours..
Not according to MyEnlighten who choose to report it in kWh more than happy for you to do the conversion. A Watt hour is a measure of power over an hour. Charge and discharge rates are measured instantaneously – in other words how much power can be absorbed or delivered at that moment. Watt hours for a battery are a measure of capacity. If your battery can only charge at 240W per hour (which I don’t know because the measurement only makes sense when time is part of the equation) then it can only charge and disharge @ about a quarter of a kW. And that is the real issue with the Enphase AC battery. In fact a single Enphase battery won’t power anything much more than lights, mobile phone chargers and a very small PC, a TV – but not all at once. It certainly won’t power an electric kettle. What’s more it can’t absorb much energy from your panels. So the rest of your power gets exported back to the grid. A single 250W panel at peak power is as much as a single battery can take. If you buy multiple Enphase batteries I estimate you would need at least 10 to give you a more useful 2.6kW continuous power. It also takes over 4 hours to charge each battery at max charge rate. Enphase offer an outstanding warranty but they can only do that because they keep it to about .25C (capacity) in and out. Nearly all LiFePO4 (any chemistry for that matter) batteries will last longer at reduced charge and discharge rates. Other similar batteries offer charge and discharge rates up to 1C or higher, with warranties approx half as long. 2. 1.5 cycles a day look HIGHLY optimistic, and suspect most people will get less than 1 cycle per day. 3. They have not taken into account the decay in battery capacity over time. 4. You can bet your bottom $ that market will not sustain 20% price rises every year for a whole range of reasons. But hey, why let realistic assumptions get in the way of a good story. Also a little concerning that they also seem to be targeting retires, with claims “Many of our customers who are getting batteries are people who have retired or nearing retirement and trying to keep their long term expenses down”. Very kind of them to attempt to relieve them of the inconvenience of their nest egg for unrealistic ROI. Interesting this was install referred to me a long time ago by Solarquotes for an install. So I go to look them up on Solarquotes today to see their ranking. Sure enough, they are not on the leader tables any more, and Solar Quotes has them as going into administration 2016. Looks like someone has phoenixed the company, but not honoring any warranty’s etc. So if anyone had a look at this company on Solar Quotes, it is unlikely that anyone would buy from them, So not surprising this sort of company is happy to make some misleading claims. Keep up the good work Solar Quote with a place to track reviews and status of this sort of company. It’s now 18 months since you wrote this article Ronald. Any change? I’m a self-funded retiree and 5 years ago stayed off getting a battery with my PV system. My biggest use of energy is during the night, keeping the aircon going whether cooling in summer or heating in winter (reverse cycle). How about some examples of aircon electricity costs summer and winter vs it coming off a battery that has been charged during the day? I’m afraid that unless you are in South Australia and can get that state’s hefty subsidy batteries won’t pay for themselves yet for any remotely normal household. But between further falls in battery prices, benefits from joining a virtual power plant, and a potential $2,000 federal subsidy at the start of 2020 if Labor is voted in, it may not be too long before they start to pay for themselves.